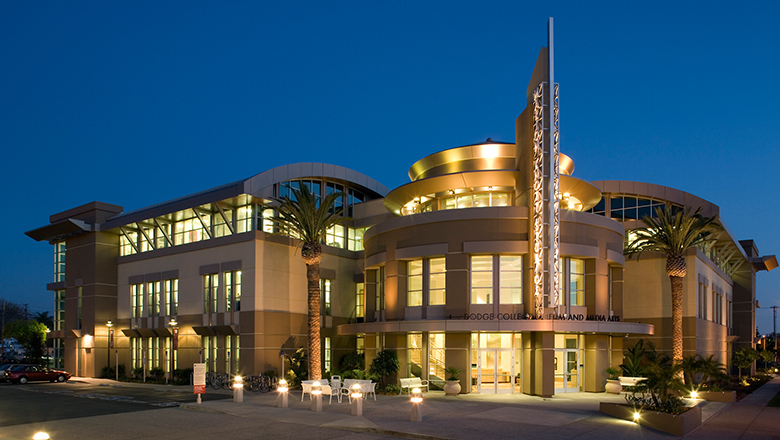 Under the leadership of Dean Robert Bassett, the following faculty have been recruited to teach at Dodge College of Film and Media Arts at Chapman University. The combined filmography of the full-time faculty includes more than 500 feature films, a record unmatched by any other film school in the country. Danielle Alexandra is CEO of the London Film and Television Group, heading a team of top US and UK writer/producer/showrunners and a multi-million-dollar production and development budget. She is also founder and CEO of GlobalView Television, one of the first global creative content companies breaking barriers and disrupting the industry with scripted internet television, headquartered in London and Silicon Valley. In January 2014, she was appointed by Prime Minister David Cameron as UK Business Ambassador for Film, Television and Global Digital New Media. She is a regular speaker internationally on behalf of UK trade investment and as an expert on digital new media, disruptive television, and internet content. To this work, Alexandra brings a 35-year award-winning career in the film and television industry as a screenwriter, film and television producer, and executive, writing and producing films and television for Universal, Warner Brothers, Fox, Paramount, Sony and Disney and in partnership with her U.S. company, The Boston Film Group. Projects have included the award-winning television series My Two Dads, which she created, and Quantum Leap, Chicago Hope, multiple television pilots, among others. She has been called "the female Tom Clancy" for her mastery of the male-dominated action and political genres and is well known as the writer and executive producer of G.I. Jane, directed by Ridley Scott, starring Demi Moore and Viggo Mortensen, and as a top script doctor for films going into production. She began her career as the youngest executive ever at Twentieth Century Fox. Cheryl Boone Isaacs was recently re-elected for a third term as President of the Academy of Motion Picture Arts and Sciences by the organization’s Board of Governors. She is beginning her 23rd year as a governor representing the Public Relations Branch. During her tenure as a governor, she served as First Vice President, Vice President, Secretary and Treasurer as well as President of the Academy Foundation, the educational and cultural arm of the Academy. In 2012, Isaacs produced the Academy’s prestigious Governors Awards. A partner in the highly regarded entertainment law firm of Nelson Davis LLP, George Davis brings expertise in contracts, rights and negotiations that bring together the key elements of every kind of production, from multi-million-dollar features to television shows that air for years to independent films. Beginning his career in mergers and acquisitions in the corporate arena at the New York firm of Weil, Gotshal & Manges, Davis subsequently came to Los Angeles to take a position in Universal Pictures' Feature Legal Department, where he negotiated writer, producer, director, actor and rights deals in the motion picture department. In 1995, he was promoted to Universal's Feature Business Affairs Department, and in 1996 he left Universal to take a position as Head of Business and Legal Affairs for Morgan Creek Productions. Davis switched to representing talent in 1997 when he joined the entertainment law firm now known as Nelson Davis LLP. Davis' clientele include many internationally-known writers, directors, producers, and actors in the feature film and television worlds, including winners of Academy, Golden Globe, and BAFTA Awards. The firm’s clients include such household names as director Peter Jackson (Lord of the Rings), and actors including Allison Janney (I, Tonya The Help), David Duchovny (TV’s The X-Files) and Ricky Gervais (The Office). Denise Di Novi made her directorial debut with the thriller Unforgettable for Warner Bros. starring Rosario Dawson and Katherine Heigl. She is responsible for over 40 feature films, working with actors over the years such as Johnny Depp, Colin Firth, Sandra Bullock, Nicole Kidman, Julianne Moore, Emma Stone, Will Smith and Ryan Gosling. She has been instrumental in bringing to the screen the work of many of today’s most imaginative filmmakers. Di Novi counts among her producing credits such diverse motion pictures as Heathers, Little Women, Practical Magic, Crazy, Stupid, Love and a number of films during her producing association with Tim Burton, including Edward Scissorhands, Batman Returns, Tim Burton’s The Nightmare Before Christmas, Ed Wood and James and the Giant Peach. Her most recent releases are Focus starring Will Smith and Margot Robbie and If I Stay starring Chloe Moretz. Di Novi began her career producing the cult favorite Heathers starring Winona Ryder. Di Novi then headed Tim Burton Productions and was responsible for producing several of Burton’s most successful films including Batman Returns and Edward Scissorhands. She set up her own production company, Di Novi Pictures, in 1993 at Columbia Pictures, producing Little Women (1994). Di Novi has collaborated with author Nicholas Sparks on five films including with Message in a Bottle starring Kevin Costner & Robin Wright, and Nights in Rodanthe starring Richard Gere and Diane Lane. Her other films include What a Girl Wants, The Sisterhood of the Traveling Pants, Ramona, Life as We Know It, and Crazy, Stupid, Love starring Steve Carell, Ryan Gosling, Julianne Moore and Emma Stone. Her early credits also include Practical Magic, which starred Sandra Bullock and Nicole Kidman. Di Novi has also ventured into television production. She served as an executive producer on the longform projects Eloise at the Plaza as well as the critically acclaimed series The District, starring Craig T. Nelson. Di Novi has had a production deal at Warner Bros. Pictures for two decades. She has a number of projects in development there, The Selection, an adaptation of the bestselling novel by Kiera Cass, Railhead, an adaptation of Philip Reeve’s upcoming sci- fi, steampunk novel to which Doug Liman is attached and the critically acclaimed novel I’ll Give You the Sun which has won the 2015 Printz Award. Larry Gross is a 36-year screenwriting veteran, producer, and director best known for his collaborations with Walter Hill. His credits include 48 Hrs., and Streets of Fire, and uncredited contributions to Ralph Bakshi's Cool World. He won the 2004 Waldo Salt Screenwriting Award at the Sundance Film Festival for We Don't Live Here Anymore. Gross attended St Edmund Hall, Oxford and Bard College, from which he graduated in 1974. He later completed an MA in English at Columbia University and graduate work in film studies at New York University. Gross' additional credits include Headin' for Broadway, Another 48 Hours, Wind, Geronimo: An American Legend, Chinese Box, This World, then the Fireworks, Rear Window, Gunshy, True Crime, The Virginian, Crime + Punishment in Suburbia, Prozac Nation, and The Beautiful Country. + - Conrad Hall, Jr.
As the second generation to carry this name into work as a cinematographer, Conrad Hall, Jr. has quickly carved out a record of achievement on his own, with exceptional work on films including Panic Room, Grosse Point Blank and The Punisher. Hall has worked in a variety of capacities in the industry, including as director of second unit photography, camera operator, first assistant camera and visual effects director of photography on films such as Se7en, Ferris Bueller’s Day Off, Free Willy, and Fight Club. Most recently, he has served as director of photography on $40M production of The King’s Daughter, starring Pierce Brosnan and William Hurt; director Antoine Fuqua’s $70M production of Olympus Has Fallen (Gerard Butler, Morgan Freeman, Aaron Eckhart) and the upcoming Out of the Blue with James Caan, Toby Jones and Jacki Weaver. Michael Phillips has been producing films and television programs in Hollywood since 1971. His films have garnered 23 Academy Award nominations, winning him a best picture Oscar for The Sting, a Palme d’Or Prize for best film for Taxi Driver, and Italy’s David di Donatello Award for Best Picture for Close Encounters of the Third Kind. He graduated from Dartmouth College with an A.B. in History in 1965 and from NYU Law School with a Juris Doctor degree in 1968. He was admitted to the New York Bar in 1969. Phillips serves as a Trustee Professor at Chapman University’s Dodge College of Film & Media Arts where he has taught classes on Cinema of the 70’s, Science Fiction in cinema, the films of Akira Kurosawa, and How I Got My Movie Made featuring filmmaking and business perspectives from today’s world. A native New Yorker, Phillips is married to entertainment attorney and novelist Juliana Maio. He is a passionate collector of ancient Asian Art and has lectured before museum audiences on the subject of the Buddha image. His film credits include Steelyard Blues, The Sting, Taxi Driver, The Big Bus,Close Encounters of the Third Kind, Heartbeeps, Cannery Row, The Flamingo Kid, Eyes of an Angel, Don't Tell Mom the Babysitter's Dead, Mom and Dad Save the World, Mimic, Impostor, and The Last Mimzy. His television credits include The Flamingo Kid, The Companion, Jane's House and Trailer Park. Happily living in Phoenix after escaping alive from L.A., Michael Schiffer wrote the groundbreaking screenplay for Colors, directed by Dennis Hopper, starring Sean Penn and Robert Duval. His next film, Lean on Me, starring Morgan Freeman, won NAACP Image Awards for Best Film and Best Actor; and was followed by Crimson Tide (Gene Hackman and Denzel Washington), The Peacemaker (George Clooney and Nicole Kidman), and The Four Feathers, starring Heath Ledger, Wes Bentley, and Kate Hudson. The writer of Call of Duty, Versions 1 and 2; Michael’s producing credits include Lean on Me, Very Bad Things, and Le Divorce, a Merchant/Ivory film, based on the novel by Diane Johnson. The author of Lessons of the Road and Ballpark, both published by Simon & Schuster, Michael is working on a new book, entitled: One Last Look at the Open Road; A memoire, revisited. In addition to serving as a trustee professor at Dodge College, Schiffer is a Creative Advisor at the Scripteast Writers Conference in Poland. Cathy Schulman is a veteran producer and film executive. She is currently Head of Production at STX Entertainment, the recently founded studio known to be lean and innovative with deep relationships in China. Growing at breakneck speed, among STX’s first slate of films to be released included The Gift (August 2015), directed by Joel Edgerton and starting Edgerton, Jason Bateman and Rebecca Hall, Secret In Their Eyes (October 2015), directed by Billy Ray and starring Julia Roberts, Nicole Kidman and Chiwetel Ejiofor and Free State Of Jones (March, 2016), directed by Gary Ross and starring Matthew McConaughey. Prior to STX, Schulman was President of Mandalay Pictures, Peter Guber’s self-financed production company that she ran since 2007. Her experience as both an executive and producer dates back to 1987. Schulman’s background includes executive jobs at companies including Sovereign Pictures, The Samuel Goldwyn Company, Savoy Pictures and APG, as well as Sundance, where she was co-director of programming in the late 80’s and early 90’s. Schulman has produced over 20 films, including Crash, for which she won the Best Picture Academy Award in 2006, The Illusionist, Thumbsucker, Darfur Now and Bernie. Her latest film Dark Places (2015) released by A24, is based on Gillian Flynn’s best-selling novel, directed by Gilles-Paquet Brenner and stars Charlize Theron, Chloe Grace Moretz, Nicholas Hoult and Christina Hendricks. At Mandalay, Schulman also produced Horns, directed by Alex Aja, starring Daniel Radcliffe and based on Joe Hill’s best-selling novel and Marjane Satrapi’s most recent film Voices, starring Ryan Reynolds, Jacki Weaver, Gemma Arterton and Anna Kendrick. Mandalay’s When The Game Stands Tall, Soul Surfer and The Kids Are All Right were also released during her tenure. Active in the industry, Schulman is the President of Women In Film, Los Angeles, a Board Member of Film Independent and has served as a Council Member of the Producers Guild of America. She is also a member of the Academy of Motion Pictures Arts and Sciences, a USC Stark Program producer's mentor and teaches graduate level film producing at UCLA and Dodge College of Film Media and Arts at Chapman University, where she was recently awarded an Honorary Doctorate. She has also served as a judge for the prestigious Samuel Goldwyn Writing Awards. She is a notable industry spokesperson and public speaker, who gave the commencement address for the 2013 graduates of the UCLA School of Theater, Film and Television and the 2014 commencement address at Dodge College. She is a graduate of Yale University, with a double major in Theater Studies and History of Art. She is the mother of one daughter and resides in Los Angeles, California. Chuck Workman’s theatrical short, Precious Images, won an Academy Award for Best Live Action Short and was selected by the Library of Congress for the National Film Registry. It has become one of the most widely shown shorts in film history, still in circulation all over the world, and is one of five of Workman’s films circulating in the collection of The Museum of Modern Art in New York. Workman’s most recent documentary, Magician, about Orson Welles, premiered at the Telluride Film Festival and has appeared in several festivals and media arts centers. He wrote, directed and produced the documentary Superstar, on artist Andy Warhol, which appeared at several festivals, is in current video release, and is also often shown in museums and media arts venues. He produced and directed The Source, a documentary film on the Beat Generation, with performance sequences starring John Turturro, Dennis Hopper, and Johnny Depp. This film premiered in competition at the Sundance Film Festival, had a broad theatrical release, and is now in digital release. His history of the motion picture, The First 100 Years, appeared on HBO, and was released by Warner Video. It received a Cable ACE Award. The Making Of A Dream, on Martin Luther King, was televised on Dr. King’s 75th Birthday in 2004. His film history of the American Presidency and popular culture, The People’s President, was shown on PBS and was invited to screen internationally as part of a U.S. State Department series called The American Documentary Showcase. He wrote and directed the documentary In Search Of Kennedy, a modern look at JFK’s life and legacy, and a documentary on Jonas Mekas and avant-garde cinema, Visionaries, which was invited to the Tribeca Film Festival, Michael Moore’s Traverse City Film Festival, and several other festivals. His recent documentary on the artistic side of film, What Is Cinema?, premiered at the Toronto Film Festival. Workman created several well-known sequences for 20 Academy Awards presentations, for which he has been nominated ten times for Emmy Awards. Workman’s film, Words, produced for the Writers Guild, was at several festivals, including New York and Denver, where it was awarded Best Short. He has made shorts for three Michael Jackson concerts, created the film shown at Michael Jackson’s memorial, and created the compilation short The Spirit Of America in response to the events of September 11, 2001, which was distributed in 10,000 theaters by the National Association of Theater Owners. Workman is the writer and director of the independent dramatic film, A House On A Hill, starring Phillip Baker Hall, Laura San Giacomo, and Shirley Knight, which appeared at several festivals, and was released in 2004. He has directed and written several dramatic shorts. The Money, his first dramatic feature, has been recently re-released with a new title, Atlantic City Jackpot. Workman directed and produced a compilation episode of Mad About You, created special sequences for theatrical and television films including Stalin and The Band Played On for HBO, and Protocol for director Herbert Ross. His video installations have been featured in London’s Museum of the Moving Image, San Francisco’s Exploratorium, the Nexus Institute of Amsterdam, Barnsdall Park Museum, and the Oakland Museum. Earlier in his career, Workman was a leading creator of film trailers. He made trailers for Star Wars, Close Encounters Of The Third Kind, American Graffiti, Paris, Texas and other major films. Workman also created main titles for movies and TV series, and directed numerous television commercials. Workman has also directed theater and opera in Los Angeles and New York, and was Artistic Director of the Chaplin Theatre Company in Hollywood and a member of the Actors Studio Playwrights and Directors group. He has written four stage plays which have been produced in the Los Angeles area: The Man Who Wore White Shoes, Diplomacy, Bruno’s Ghost, and Bloomers. He is a former President of the International Documentary Association and received its Distinguished Achievement Award. He was a Commissioner of the Santa Monica Arts Commission and former Board Member of the Directors Guild of America, where he directs its documentary screening series. He was on the Motion Picture Academy Documentary Executive Committee and is on the Academy Grants Committee. He has lectured in filmmaking at many media arts centers and colleges, and contributed articles on filmmaking to several magazines. Workman graduated Rutgers University, and studied theater and drama with Francis Fergusson, Harold Clurman, and Stella Adler. He was recently Distinguished Artist and Visiting Associate Professor at SUNY Purchase College in Purchase, NY, and has been appointed Professor and Director of the Documentary Program for Dodge College at Chapman University. Workman has been given career tributes for his work at festivals including the Mill Valley Festival, the St. Louis Film Festival, the Big Sky Festival, the Ft. Lauderdale Festival, and others. Matt Zoller Seitz, former critic for The New York Times, called him one of the three most influential editors of the past 50 years. A steady stream of Hollywood guests has included Ted Sarandos, Steve Mosko, Michael Lynton, Glen Keane, Jon Favreau, Brad Bird, Chris Buck, Ed Carroll, Amy Pascal, Sid Ganis, Mark Andrews, Robert Zemeckis, Bryan Singer, Garry Marshall, Catherine Hardwick, Rob Cohen, and executives from the major studios, cable networks, literary and talent agencies, among others.